Although August is the month that most Italians leave the cities to spend some time al mare, there is still plenty left to do for those left behind from food festivals, medieval re-enactments, and Jazz! Enjoy the Ferragosto week and check out this list for more activities on August 15th. The town of Carrara is famous for its delicious lardo made by curing strips of fatback with rosemary and other herbs and spices. 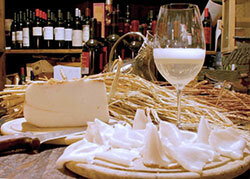 Colonnata is a frazione of Carrara (of only 350 inhabitants) and famous for its marble. The lardo is cured for months in basins made of local marble. With the medieval festival and re-enactments, that takes place every year in Pontremoli, the village remembers the granting of the degree of Free Community to Pontremoli by the Emperor Frederick II in 1226. 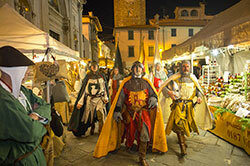 To celebrate this historic event, Pontremoli is transformed into a medieval town again. Cars will be banned from the historic center to make room for wayfarers, merchants, carriages and riders. With numerous extras in costume representing the medieval social classes: the clergy, the nobility, soldiers, courtiers, and farmers. 3 pm | Opening of the Medieval Games. 9.30 pm | Reception of the Emperor Frederick II with a show in his honor and historical parade through the center. 9.30 pm | Challenge of the Cortina Cacciaguerra between the districts of Sommoborgo, Imoborgo et Comtat. 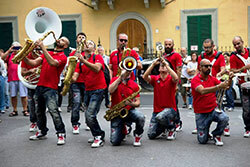 The city of Barga is the place to be for Jazz lovers next Sunday, August 21 when the 30th edition of Barga IN Jazz will take place in the streets and squares of the town. The festival kicks off at 6 pm with a large street band roaming the streets of the historical center. 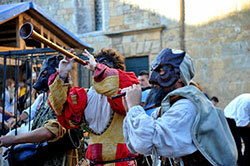 The annual medieval festival in the historical center of Volterra will transport you back in time. Fiery steeds, brave knights, noblemen, ladies, monks and friars, artisans and merchants, peasants and farmers, flag throwers, archers and soldiers, jugglers, musicians and jesters will revive magically different aspects of the mysterious Middle Ages of Volterra. The 19th edition of Volterra A.D. 1398 has two unforgettable settings: the town center, with its imposing palazzi and squares, and the Archaeological Park, over which the Medici Fortress reigns. The high point of the program is the “Festival Day of A.D 1398”, on Sunday 21st and 28th of August, from morning to nightfall. On this exceptional day, a medieval town comes back to life with its performances, events, tradesmen, artisans, musicians, jugglers, peasants and nobles. A unique occasion to experience, as if by magic, medieval times in one of the most beautiful cities in Tuscany. Festival’s must-see: the Taverns and the Market where you can taste medieval recipes, the Hangman’s Scaffold, the reconstruction of a medieval Convent and Hospital, Arts and Crafts, shooting with bow and short bow in the military camps, games, and painting for children, medieval costumes for rent and hawk shows.